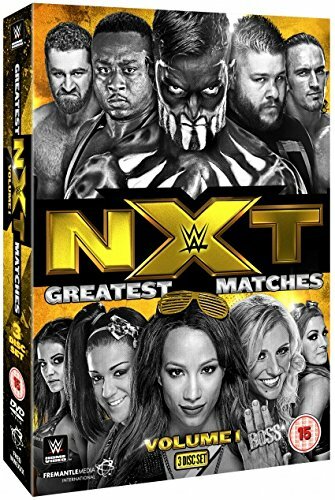 It’s only March and I’m sorry to all other wrestling DVDs scheduled to be released in 2016, but I think with NXT Greatest Matches Vol. 1 we already have the 2016 wrestling DVD of the year. This is one of those rare occasions where I can safely say the rest of the words in this review are a waste of time to write and an even greater waste of time to read: you simply need to go out and buy this now. Three discs and not a bad match amongst them, informative video packages in between detailing the genesis and evolution of the NXT brand, and a clear story arc from the humble beginnings of NXT on WWE.com to its eventual “takeover” of the WWE Network. This is literally the perfect wrestling compilation. But, you know, I do have a word limit to meet, so I guess I am forced to gush some more. Let’s start with the talent. At one point in the collection, Triple H points out that at Wrestlemania 31, there was NXT alumni in every match on the card except for his own match against Sting. Whether it was former members of the Shield in their respective title matches or main event spots, the Wyatts in high profile positions, Paige in the only Divas match on the card, Rusev riding in on a tank before battling John Cena, Big E and Xavier Woods breaking through as the New Day, or Hideo Itami winning a chance to fight in the Andre The Giant Memorial Battle Royal, NXT was featured heavily on the “grandest stage of them all”, and NXT Greatest Matches Vol.1 let’s us see these fledgling superstars in their early days, carving out the start of the careers that would take them to the “showcase of the immortals”. So we see Seth Rollins in his days as NXT champion, before he traded it in for WWE World Heavyweight gold. We see Big E back when he still had a surname, a nascent Bray Wyatt back when his nonsense-rambles were still charming and creepy. But the real star of the three disc set has got to be Cesaro. Featuring in no less than three matches (including a fantastic rarity against Neville from the Arnold Classic exhibition: no commentary just raw, live and mind-blowingly awesome), Cesaro demonstrates in each match what makes NXT so great compared to their parent company, WWE. While Cesaro floundered in the mid-card of Raw and Smackdown, his matches against Sami Zayn, William Regal and Neville on NXT allowed him to steal the show, liberating his in-ring performance and showing us what he was really capable of. Indeed, it is surprising to see Jinder Mahal, former Three Man Band alumni, being a genuine competitor for the NXT title after seeing him booked so badly as a joke over on WWE TV; and Tyson Kidd’s resurgence before his injury set-backs was entirely down to reinventing himself on NXT. The flipside to this is having to watch current WWE mid-carders back in their former glory days, before WWE creative worked their “genius” on them and lost them all credibility. Bo Dallas reminds us that before he was a Social Outcast he was an NXT champion. Neville demonstrates that, before they put him in a cape, he was a serious, hard-hitting competitor. And Tyler Breeze, once upon a time, was clearly the greatest wrestler never to hold the NXT title. What is made clear throughout, is that NXT is special; that in many respects NXT is simply better than WWE. The perfect encapsulation of this was a quote from one current NXT wrestler who says everyone in NXT is there because they ultimately want to be brought up to the main WWE roster…but no one wants the call to come anytime soon because they’re having too much fun. The best thing about NXT Greatest Matches Vol.1. though, is how seriously women’s wrestling is taken. The “Divas Revolution” currently trying to transform WWE happened long before, and organically, in NXT, and the women of NXT are well-represented across the collection. Not only do they share equal billing on the cover with the men, but they are the focus of many of the interstitial segments between matches. Then there are the matches themselves: Paige vs Emma, Charlotte Vs Natalya, Charlotte Vs Sasha Banks Vs Becky Lynch Vs Bayley, and Sasha Banks vs Bayley all feature prominently — a marvel in a marketplace where such DVDs used to feature maybe one or two brief “Divas” matches, few of which were worth watching. All of the women’s matches on this collection are show-stealers, and it is great to know that there are so many more awesome women’s matches to come on Volume 2 as the real revolution in women’s wrestling continues to happen week after week on NXT TV. That’s not to say the men aren’t having great matches too. The astounding title match from Japan between Finn Balor and Kevin Owens is a thing of greatness, as is Owen’s brutal NXT title match against his former friend, Sami Zayn.